I think I remember reading about a book titled, “No More Dumpster Projects.” Clearly I need to read this book. 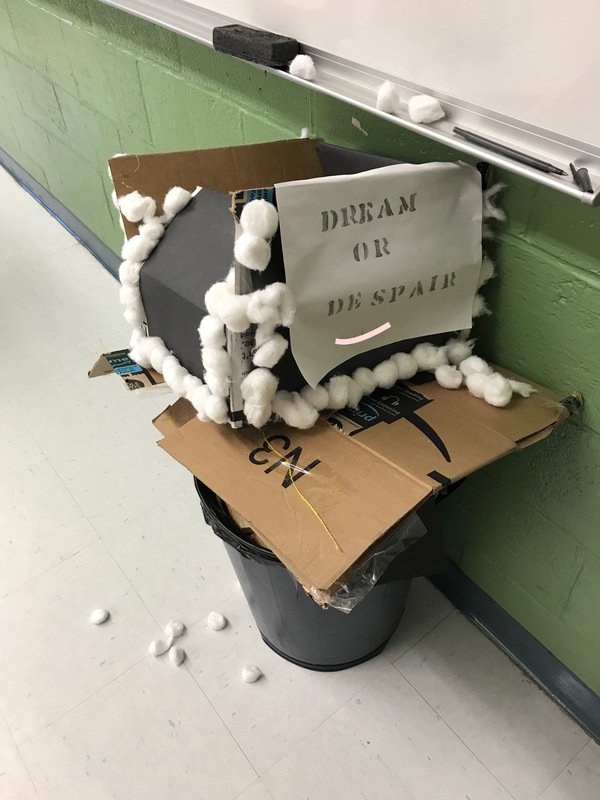 Why did I think that the students would want to keep their projects? I think I was more invested in the projects than they were. How can I instill more pride and ownership in my students? Once the get to be seniors, is it too late? Many of my students attending technical CTE classes starting in their junior year. They travel to a CTE school about 15 minutes away. There, they can sign up for classes such as welding, childcare, computers, carpentry, and automotives. I know that these hands-on classes are highly motivating, and I’ve often been puzzled as to how I can establish and nurture that same excitement in my English classes. How can I make the learning of English–reading, writing, listening, speaking–hands-on? When I learned about the maker movement this summer, I thought, This is it! This is how I can get the kids up and out of their seats, and excited about English. I know I’ve just started on the makerspace journey, but seeing these projects in the trash today just set me back a bit. I’m a bit discouraged, but I will continue to try to bring makerspace and maker station ideas to my high school English students.